I had an irrational desire to buy this pattern. Completely irrational, because in my pre wedding dress sewing days** my thoughts on sewing knits were, roughly: That ish costs like $4 to buy at H&M and you only need to replace it once every 5 years. Not worth the opportunity cost of the hours expended. At this point, I’ve made three pairs of Anima pants. The first ones were ‘wadders’ (which, you British English speaking people: That word is so accurate but so gross.). The second ones were much improved after I went down to a size XS, listened to the directions about the elastic being 2″ in width, and I did a few things on fit. I am really happy with them and wear them every day when I come home. The third are [squee! etc] sequins and were inspired by this pin. 1. I shortened by an inch at the front and back crotch. [Trendy high waist designed for the 5’4″-5’7″ lady looks like ‘I can’t find my pants so I put on some grown-up’s’ on the short people.] This was after going down from a small (unphotographed wadders) to an extra-small. I didn’t know what I was doing, and was scared of effing up the pocket slant/pocket bag seam alignment. I took my inch from the front crotch out below where the bottom of the pocket bag is stitched in. On the back, I just lopped one inch off the top. Consider plea for more SHORTEN/LENGTHEN HERE lines reiterated. 2. Eff Cuffs. No, don’t worry, they look cute on you. But my calves are approximately the width of my thighs. The cuff that takes these pants from normal taper to trendy-skinny -leg-taper just won’t look good on me, so I left them off. 3. That three-step zig-zag stitch is your friend. I don’t know about you, but on super stretchy things, I find a normal zig zag stitch pops open a lot. That’s not really acceptable, even for pants you only wear inside your house. And specific to the ITY version, which I put on just about every day after work. 1. No one is too good for some ITY knit. I like me some silk and wool as much as the next girl, but this early version from ITY is fantastic. The fabric was $3/yard from FabricMart, so I didn’t mind that I had to trash the first pair. A better woman would have done something more street-worthy with this print, but I’m just not that woman. <– Welcome to every day after work. And specific to the sequin version, which I think I will wear for my 30th birthday party, because these things need an excuse. 1. I eliminated the faux fly front. Seemed complicated to top stitch over shiny plastic discs. I actually eliminated it on the second lace-look ITYs as well, as I wanted to make sure I wouldn’t screw something crucial up by just slicing the fly fabric right off the front crotch. 3. The waist band is a heavier ponte knit, also from Spandex House. 4. Sewing with sequins is not that hard, and it’s a total lie that your needle can’t make it through. Every result for ‘how do i sew with sequins’ that google spat back at me suggested basting your sequin fabric to your underlining along the stitching line (which I actually did) and then SEAM RIPPING ALL THE SEQUINS IN THE SEAM ALLOWANCE OFF THEIR NETTING. Which is insane. I tried. For about 30 minutes. My 1/2 inch of progress led me to say EFF IT and just go and sew the pieces together. 5. Sequins are scratchy if you leave them in the seam allowance. I actually find it’s easier for me to use the seam ripper and tear them out from the seam allowance now that the fabric is secured in that three-step zig zag stitch. This is a gradual process, and priority is on the crotch seam. Obviously. Also. 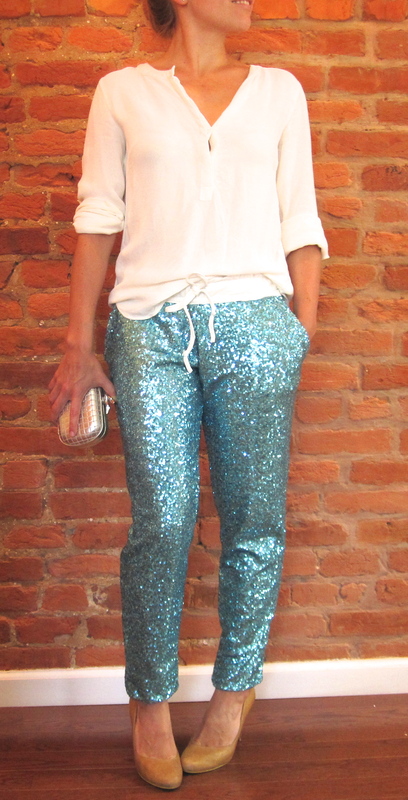 You will have sequins everywhere. Everywhere. That’s all I have to say, I think! The Anima pants are pretty cute, and I like the included options for shorts and knee-length. And I really like not being disappointed by the directions (Actually, this was a first for me, not being disappointed and going ‘lolwhut’ when mid-assembly). 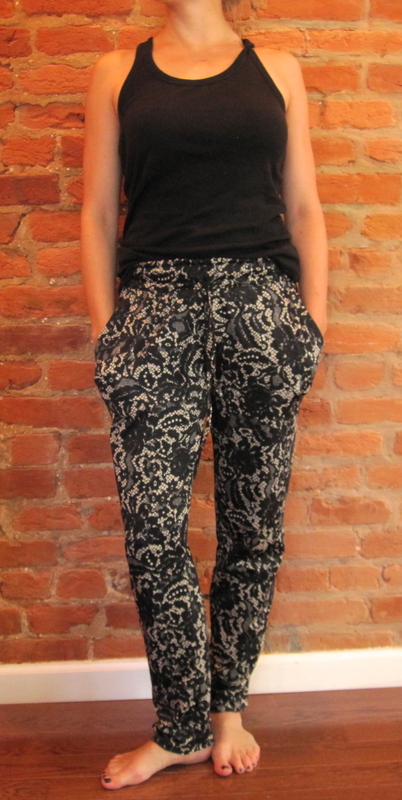 But there are a lot of options out there for this style pant: Vogue; True Bias; and Aime Comme Marie to name a few. Though that last one wins my heart simply for the phrase “Pour le shorty” in the fabric requirements. Pour le shorty indeed. **I know I haven’t blogged it. I was kind of traumatized by the hectic pace the month before the wedding and haven’t really wanted to dig deep enough into my memory to write about that dress. I love the sequins, what a great idea. I’ve been doing a lot of knits lately on my regular machine and I love them too. They make fitting so much easier and its surprising how fast something like a t-shirt goes. They look awesome. I just bought this pattern and I’m looking for inspitmration as far as the design goes. Thank you for sharing. You did a beautiful job.